When making dolls like these ones below, they may not always stand up straight. To fix this, you can fill the bottom of your doll with something heavy, like dried chickpeas or rice. But it also helps to make sure your doll’s feet are flat, which is what I will teach you now 🙂 It’s really easy, just 3 steps! I also have a video about this if you prefer that. To do this, you need plastic mesh (also called plastic canvas), which you can often find in stores where they also sell embroidery or cross stitch materials. If you can’t find this, you can also do the same with a piece of cardstock, but then you can not wash your finished product. 1. 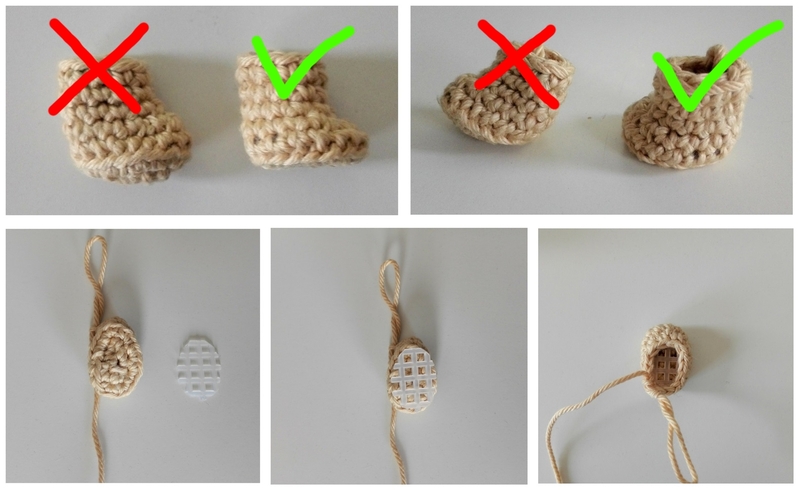 Cut a piece of mesh in the size of the bottom of your amigurumi. In my case, this is the size of the feet of my doll. 3. Finish your amigurumi like you would normally. That’s it! And as you can see, the difference is massive, so it’s really worth the little extra effort in my opinion.